Check out these amazing uranium facts, uses and properties. Uranium is a radioactive metal that can produce massive amounts of energy, it has been used as far back as ancient Rome as a coloring for glass. Learn more about this famous metal and its unique nuclear properties with our interesting facts about uranium. Uranium is a chemical element, its symbol is U and its atomic number is 92. Refined uranium is a silvery-white weakly radioactive metal. Uranium is hard, malleable, ductile, and a poor electrical conductor. The metal has a very high density, around 70% denser than lead, yet less dense than gold. There are three naturally occurring uranium isotopes. Uranium-238 is the most stable of these and makes up over 99%, uranium-235 makes up 0.72% of natural uranium and uranium-234 just 0.005%. German chemist Martin Heinrich Klaproth is credited with discovering uranium in 1789. He named the new element after the recently discovered planet Uranus. In 1841, Eugène-Melchior Péligot became the first person to isolate uranium and in 1896 Henri Becquerel discovered it had radioactive properties. Uranium has a melting point of 2,075 °F (1,135 °C) and a boiling point of 7,468 °F (4,131 °C). Fissile isotopes of uranium have the ability to cause a nuclear chain reaction making the metal important for generating heat in nuclear power reactors and producing fissile material for nuclear weapons. 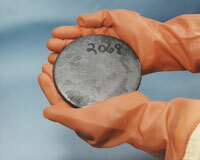 Uranium-235 is the most important uranium isotope for the creation of nuclear reactors and weapons because it is the only naturally occurring isotope that is fissile (meaning it can be split into 2 or 3 fission fragments by thermal neutrons). One kilogram of 235U can theoretically produce 20 terajoules of energy, equivalent to the energy produced from 1500 tonnes of coal. The first atomic bomb used in World War II, dropped on Hiroshima, Japan, in 1945, contained a uranium core. Today nuclear bombs are usually made from other materials such as plutonium. The military uses uranium when making special ammunition. It helps make bullets and larger projectiles hard and dense enough to punch through armor. Over 33% of the world's uranium is mined in Kazakhstan. Other uranium mining countries include Canada, Australia, Namibia, Niger, and Russia. Marie Curie's discovery of radium in uranium ore meant uranium mining increased so radium could be extracted to make glow-in-the-dark paints. It takes 3 tonnes of uranium to get 1 gram of radium, leaving massive amounts of uranium waste material which was sent for use in the glazing and tiling industry.